The chasm between industry needs and our educational system has accelerated and our current educational model is quickly going broke, increasingly hampered by educational costs, skyrocketing tuition fees and student loans. Educational institutions continue doing what they always have done, seeking public funding, asking alumni for donations and courting charitable foundations and wealthy individuals for gifts. So, how can we redesign our current financial model to work more effectively? 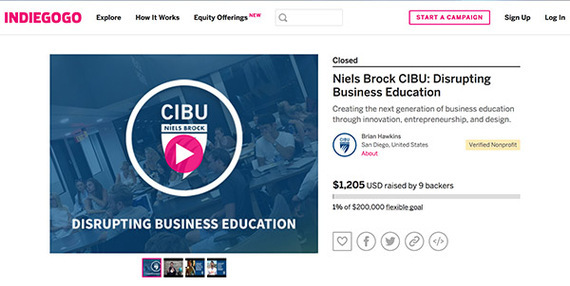 Niels Brock, a highly reputable business school in Copenhagen, Denmark, with over a hundred years in education and a large alumni network, recently acquired CIBU, a small struggling business school in San Diego, California, renaming it Niels Brock San Diego University. Niels Brock San Diego University recently experimented with crowdfunding to raise capital for their ambitious innovative change program. The thinking behind this bold move asked why business school business models remain static when everything else is changing. It appears that top-tier business schools push progress through entrepreneurship and innovation, however can display conformity and risk averse behavior in their own business dealings. It seemed time to challenge the way business schools do business. Teaming up with Bayfish and 3 Strand Innovation, two California based creative agencies, they crafted a well-designed Indiegogo crowdfunding campaign to run in the fall of 2016 with the goal of raising a modest $200,000. After only a couple of weeks, it was clear to everyone that the campaign was doomed to failure. The team was not blind to the poor odds available in this case. Despite CIBU having been in business for twenty years, the school had built a limited alumni network due to its small size. No amount of blogging on LinkedIn and publishing on new online media could make up for this handicap. An unwanted outcome does not indicate poor judgement and decision-making, however, in fact, the more innovative the project, the higher the degree of ambiguity, lack of clarity and risk. In a study of new product development funding campaigns on the crowdfunding platform Kickstarter showed that out of ten thousand campaigns only around fifty raised more than $500,000 and the average take was no more than $7,000. Despite these daunting statistics, the team forged ahead seeking to improve the odds by doing an excellent job implementing the campaign. However, this was not enough to make up for the main obstacle, the school's low brand value and weak social network. Was the whole experiment worth the effort and opportunity cost? In immediate financial terms - clearly not, however, in a larger perspective, it could be seen as a long term investment. For a relatively small budget, the school gained first-hand experience in applying new funding tools, as well as, working with a creative agency, something CIBU had never done before. The process also helped the management team to crystalize what made the school unique and to formulate the changes they want to implement in the near future. In conclusion, pushing the boundaries of one's field is neither easy nor cheap, however, one can gain evidence-based insights by launching a series of smaller experiments and thus feel one's way to a viable strategy. As Thomas Edison once said, "I have not failed. I've just found 10,000 ways that won't work."